Shirley hiking up to Rif. 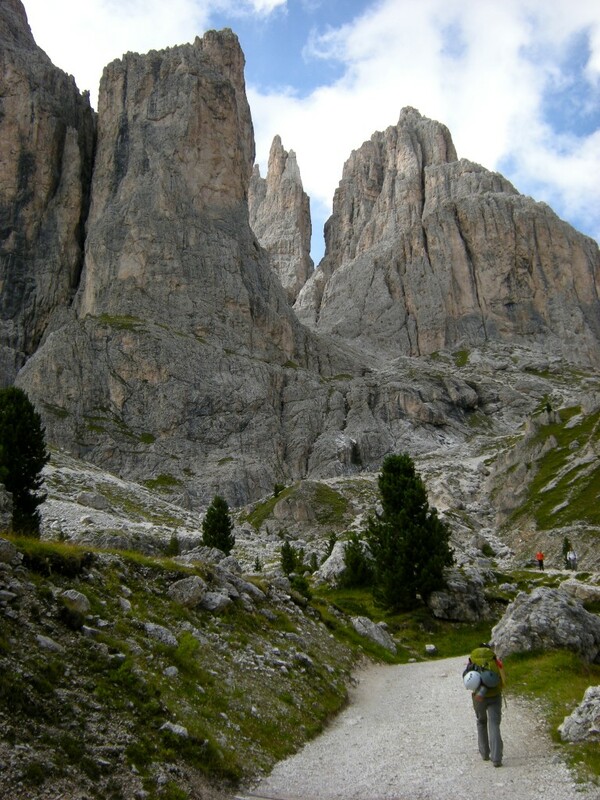 Vajolet near the base of Cima Catinaccio (tallest formation in the photo). Our planned Steger route climbs the prominent east face in a nearly direct line to the summit (Sept. 2008). 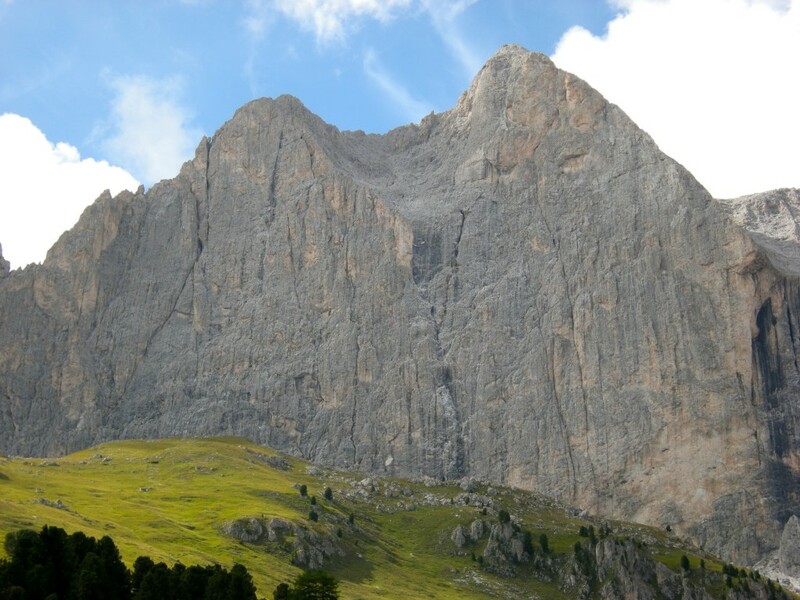 The impressive looking east face of Cima Catinaccio. 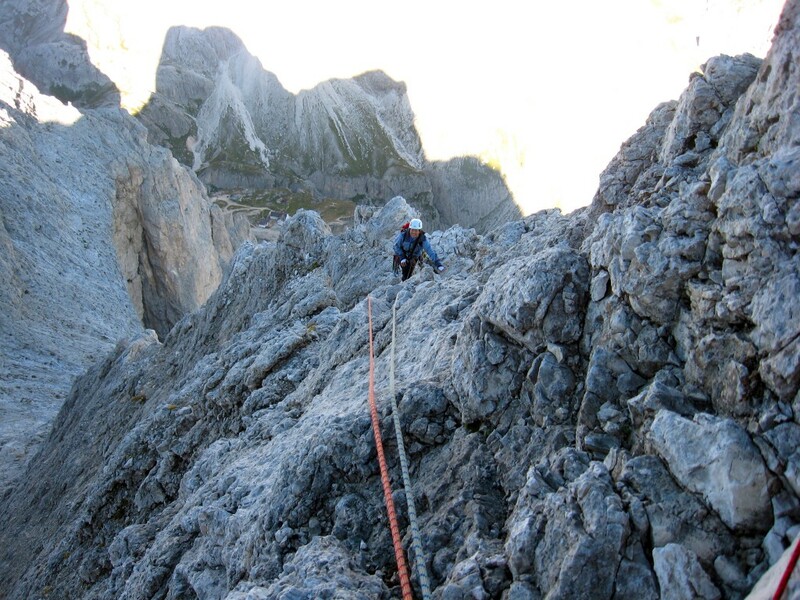 The 18-pitch Steger route climbs (more or less) the plumb line up to the higher (right) summit (Sept. 2008). 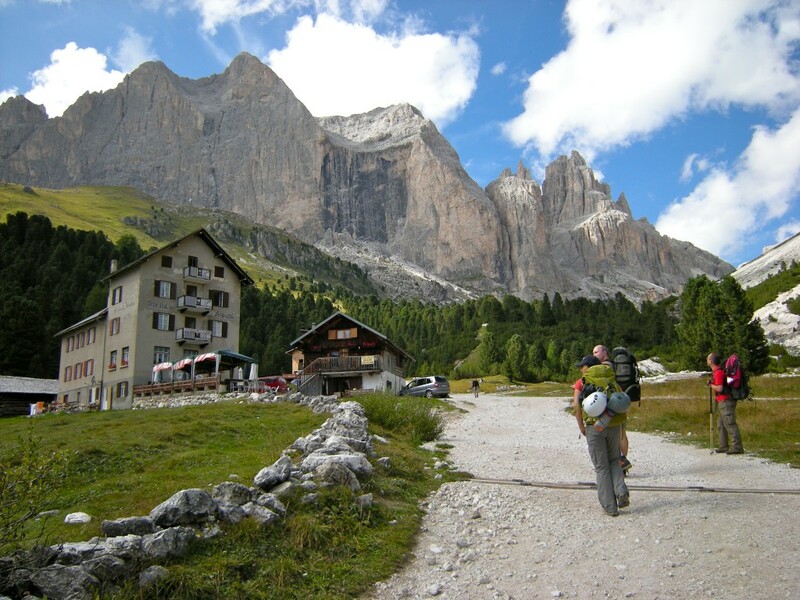 Shirley on the approach hike to Rifugio Vajolet the day before our climb of the Steger route on Cima Catinaccio. 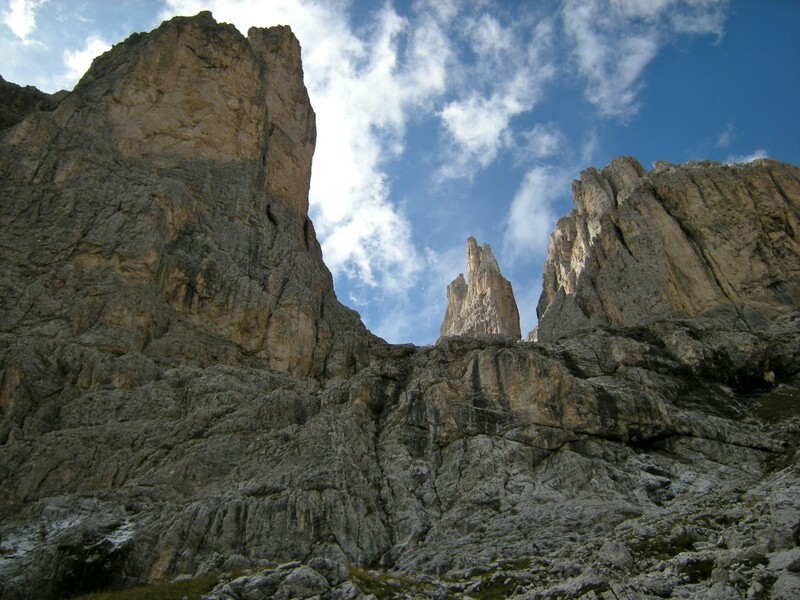 Punta Emma is on the left; Vajolet Towers are peeping in through the notch (…next time; Sept. 2008). 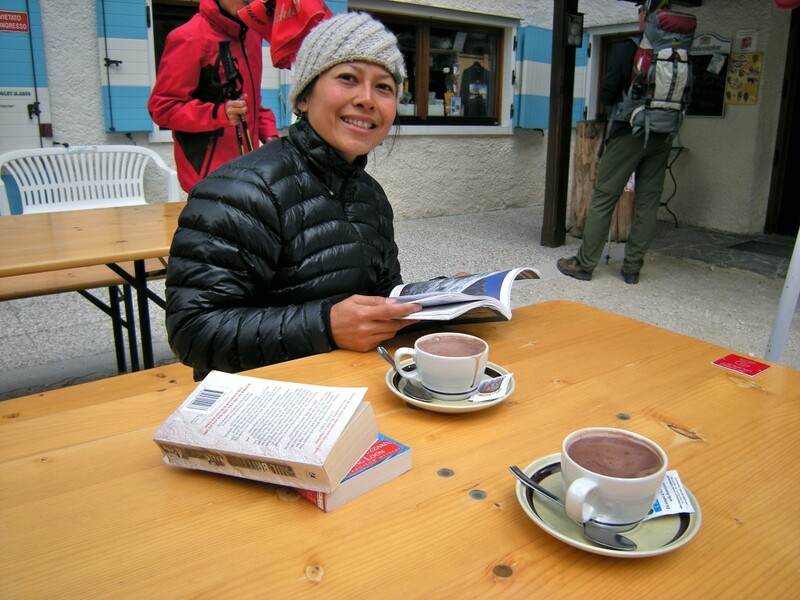 A pre-sleep hot chocolate at Rifugio Vajolet…really got spoiled by the hut system in the Dolomites. Perhaps not wilderness but we’re soft and it was kind of a nice change for a while (Sept. 2008). 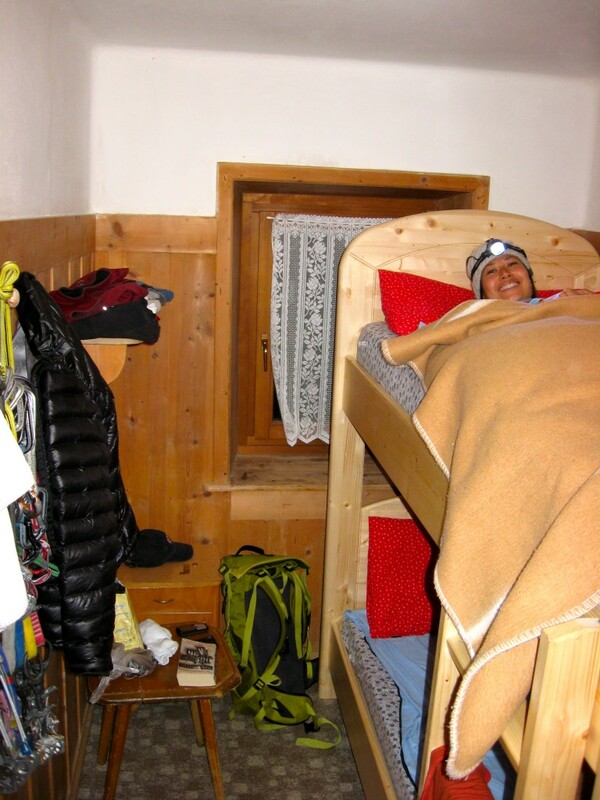 Comfy private room at Rifugio Vajolet – very nice! 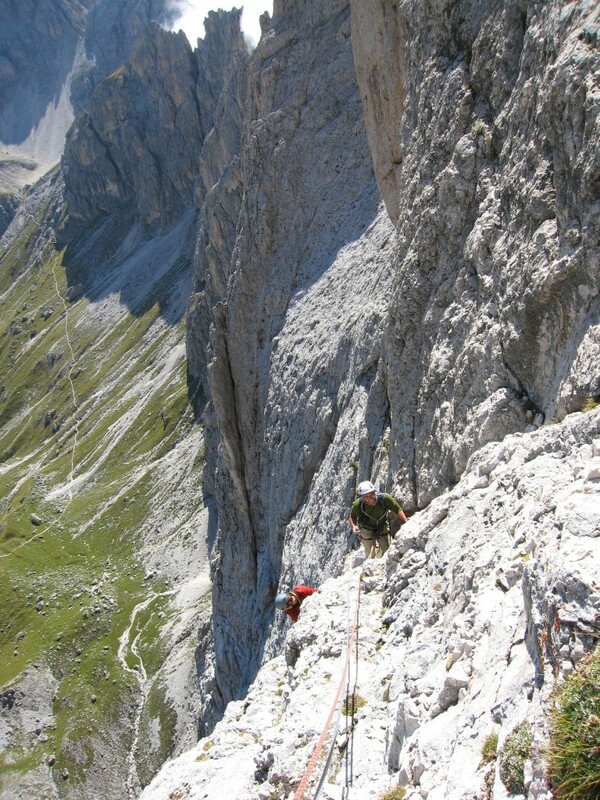 Leading pitch 3 of Steger (Sept. 2008). 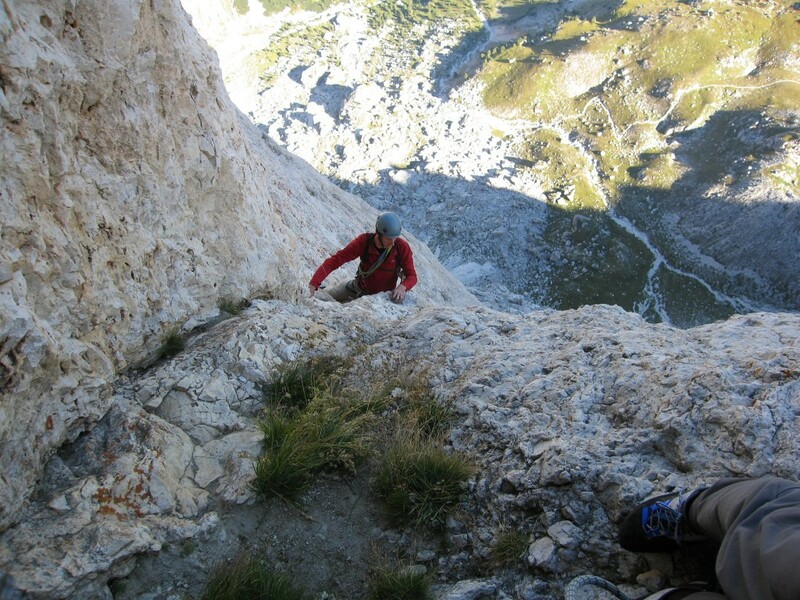 Natural chockstone pro on Cima Catinaccio’s Steger route…felt bomber (Sept. 2008). 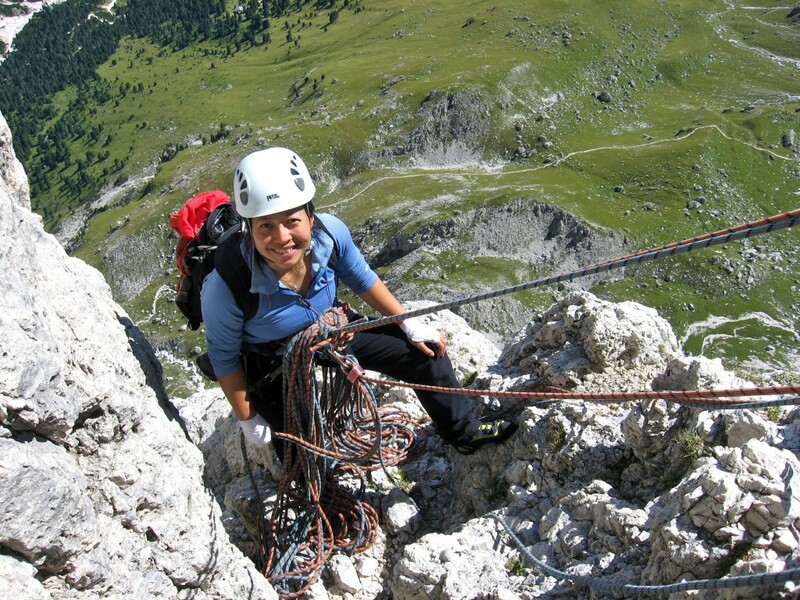 Shirley on pitch 3 (per Memmel & Kohler guidebook) of Cima Catinaccio’s Steger route (Sept. 2008). 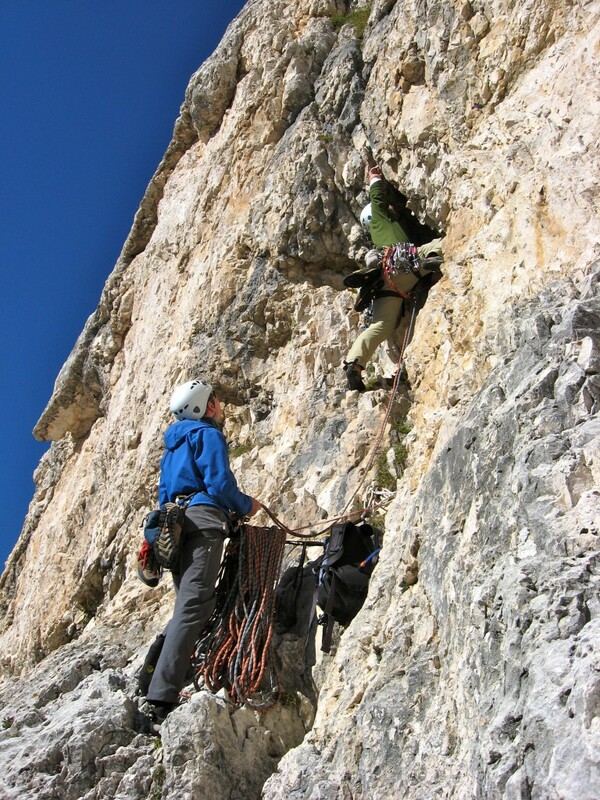 Starting the lead of the fourth pitch of Steger (Sept. 2008). 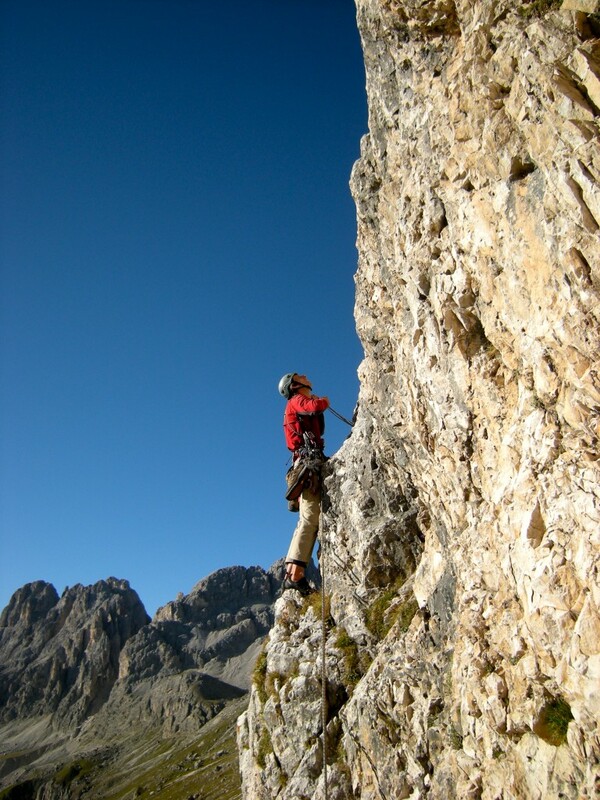 Shirley topping out on the 4th pitch of Steger (Sept. 2008). Our Canadian friends (from cascadeclimbers.com no less) starting up the 5th pitch. 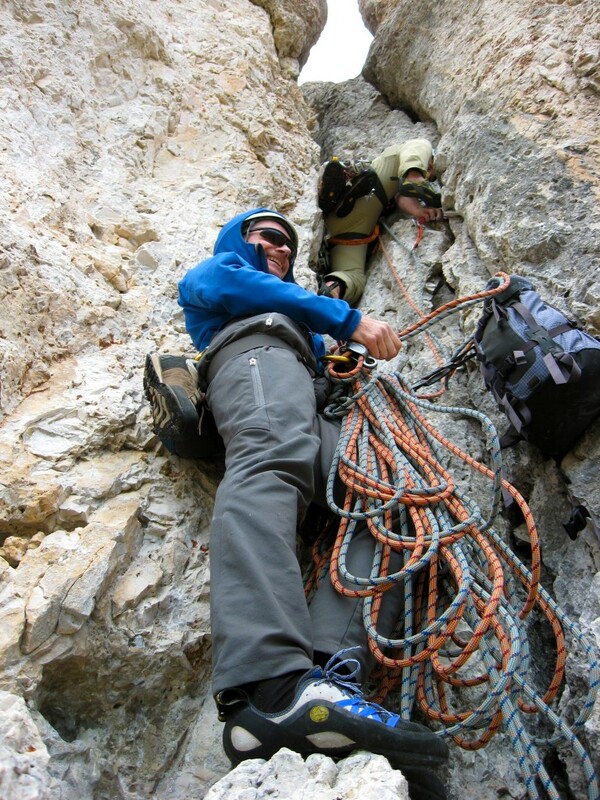 Jesse leading and Graham belaying (Sept. 2008). 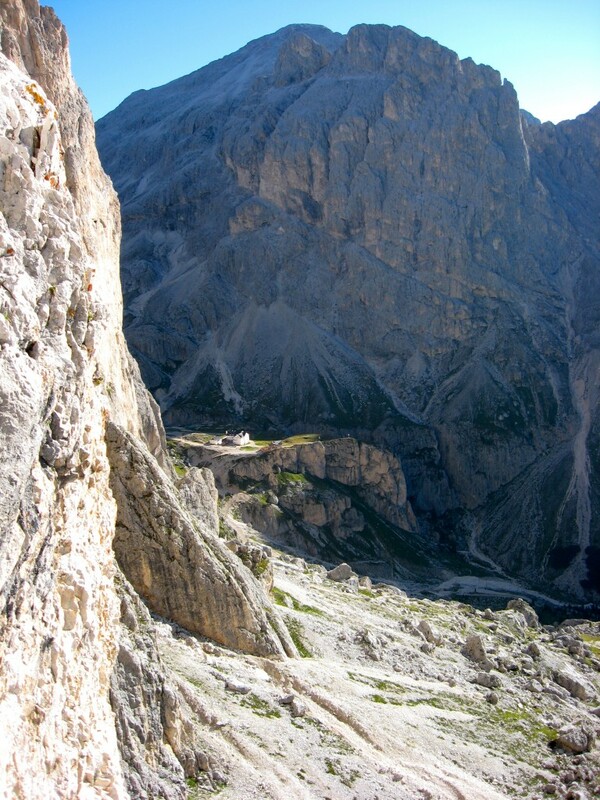 Looking back towards Rifugio Vajolet from low on the Steger route (Sept. 2008). 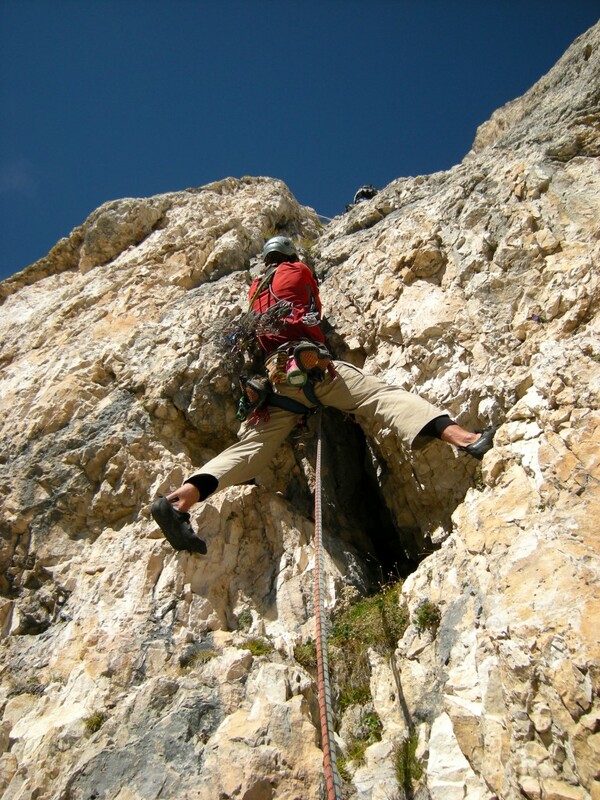 Leading the 5th pitch of Steger (Sept. 2008). 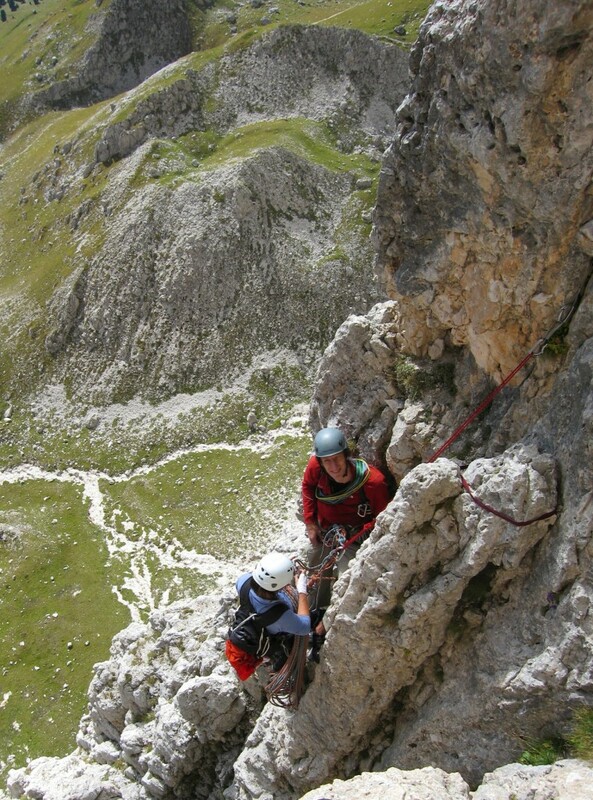 Shirley & I at a belay somewhere high on the Steger route on Cima Catinaccio’s east face. Photo courtesy of Graham R. of British Columbia (thanks! Good old days of summer 2008). Shirley at the 7th belay on the Steger route. 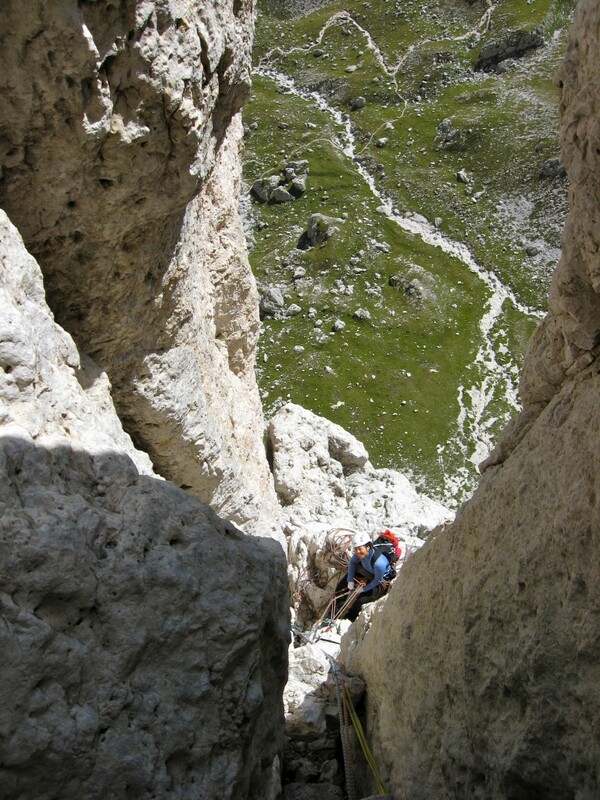 This is where a slight rightward traverse starts (Sept. 2008). Graham belaying Jessi on the start of pitch 10 (chimney) of Steger (Sept. 2008). 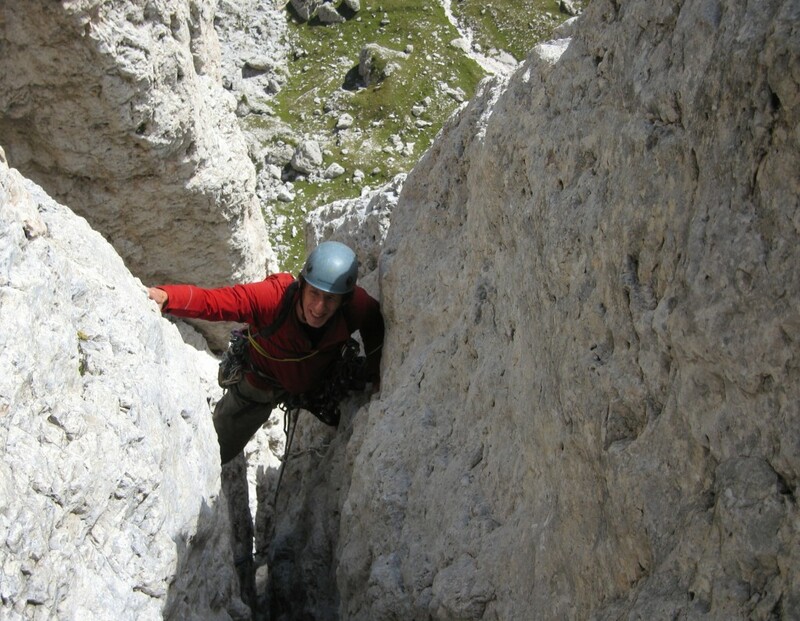 Yours truly somewhere midway up Steger route on Cima Catinaccio’s east face. Photo courtesy of Graham R. of BC Canada (summer 2008). Looking back at Shirley from the chimney on pitch 10 of Steger (Sept. 2008). 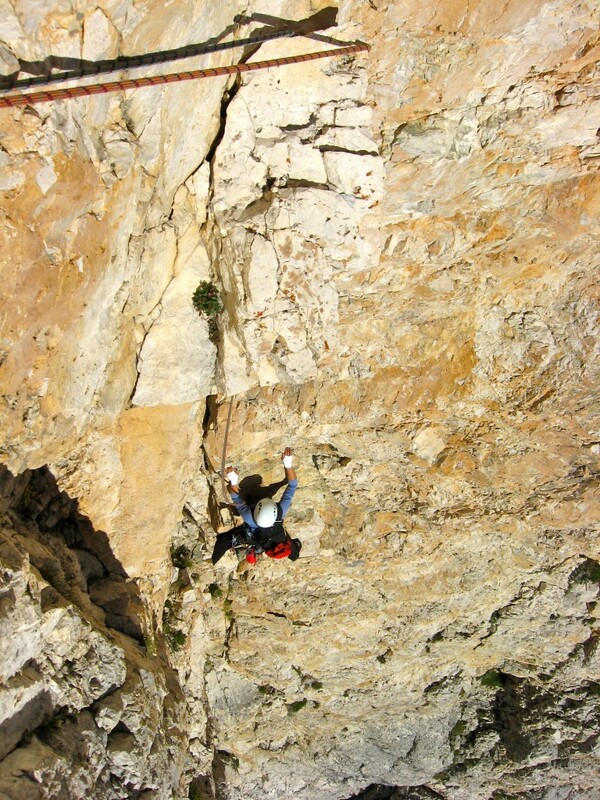 Shirley topping out on pitch 10 of Steger. Looking approx. east from high up on Steger. 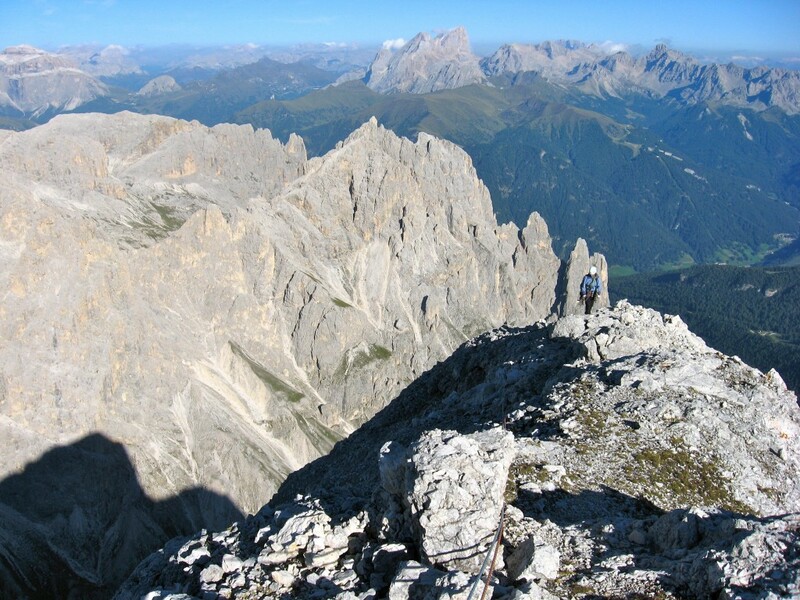 That snowy peak on the left in the far background is most likely Marmolada (with its glacier; Sept. 2008). 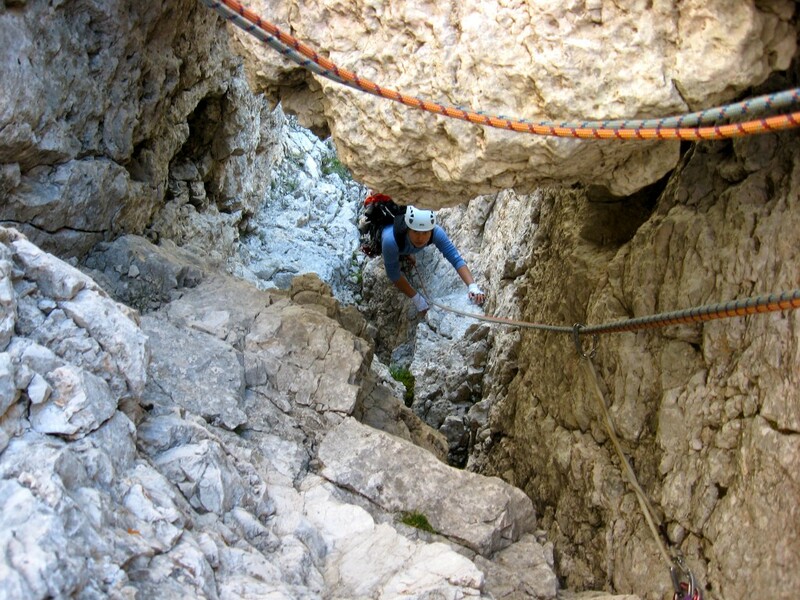 Leading the 12th pitch of the Steger route – tunnel under the huge chockstone (Sept. 2008). 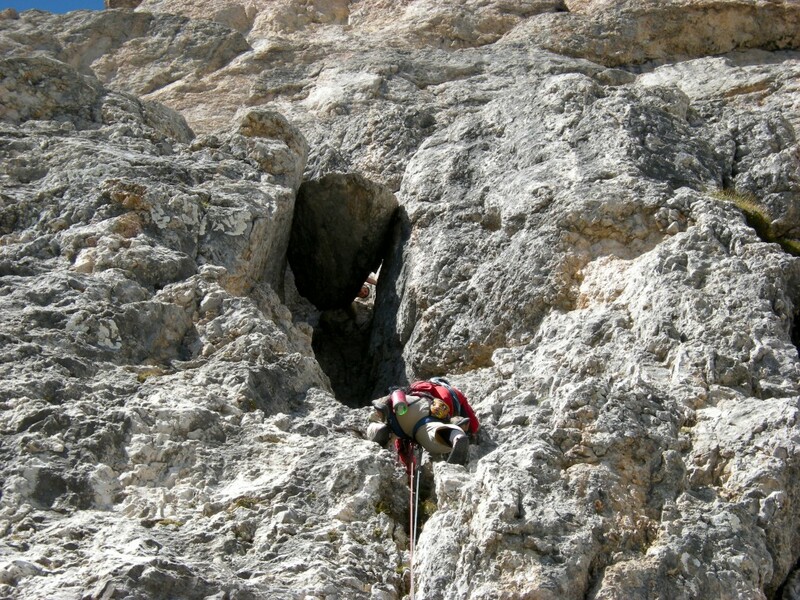 Shirley tunneling under the chockstone on pitch 12 of Steger (Sept. 2008). 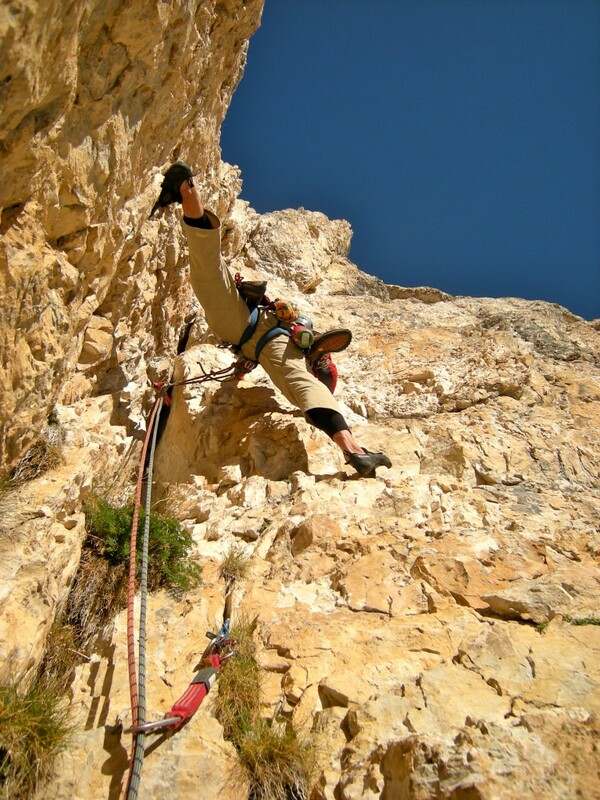 Shirley at the 13th or 14th belay on Steger (Sept. 2008). 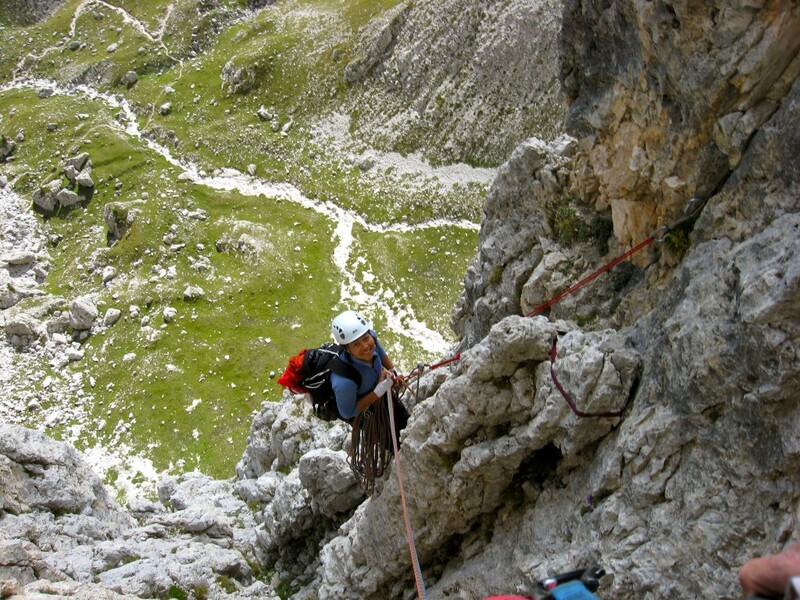 Jessi of BC, Canada & yours truly (red) high on Steger route on Cima Catinaccio’s east face. Photo courtesy of Graham R. of BC (summer 2008). 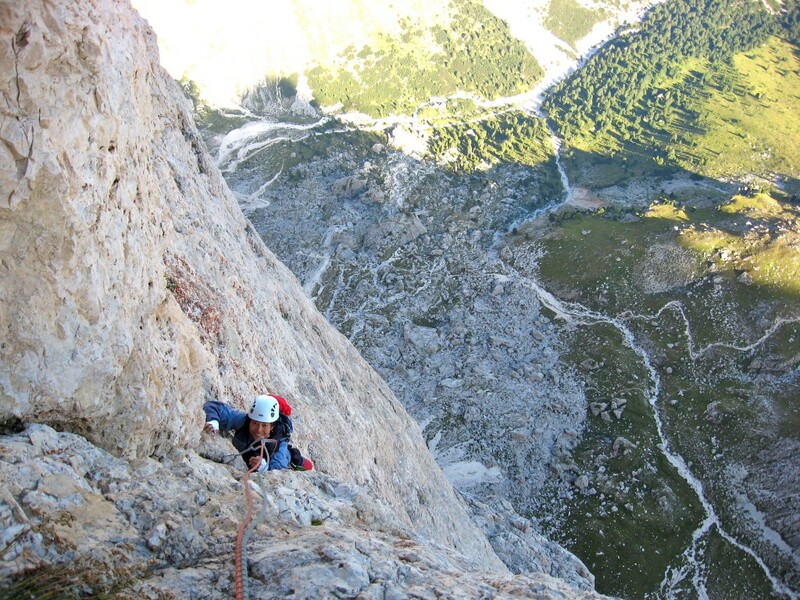 Yours truly high (~2 pitches from top of route) on Steger on Cima Catinaccio’s east face. Photo by Graham R. of BC Canada (summer 2008). Shirley on the 17th and best pitch of Steger. 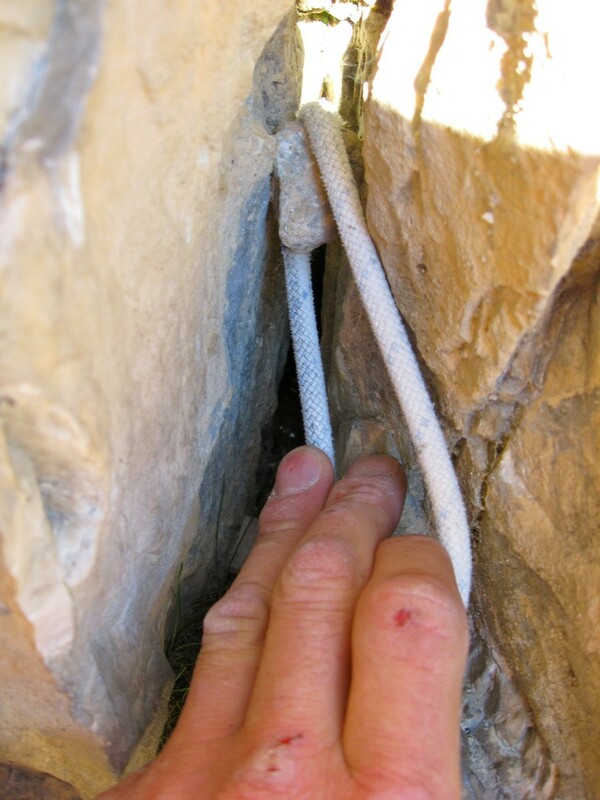 Fun face climbing leading into a chimney that is the last pitch (Sept. 2008). 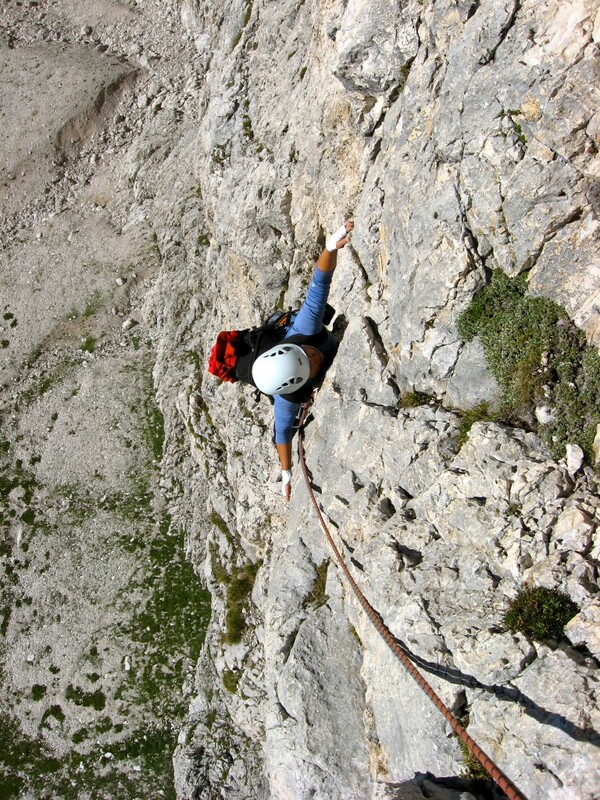 Shirley on the long (~100m) low 5th class scramble to the summit of Cima Catinaccio. This is above the end of the Steger route. 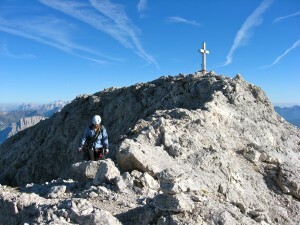 Rifugio Vajolet is visible below (Sept. 2008). 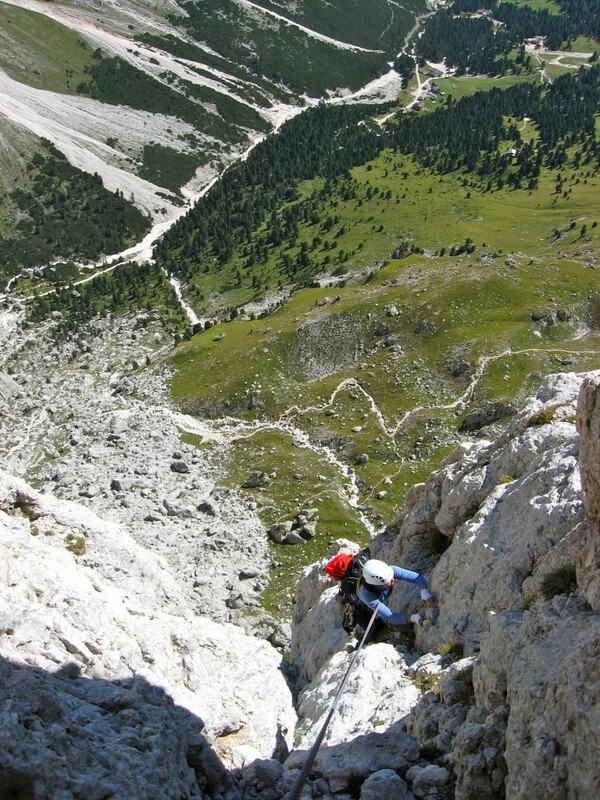 More scrambling terrain to the summit of Cima Catinaccio (Sept. 2008). 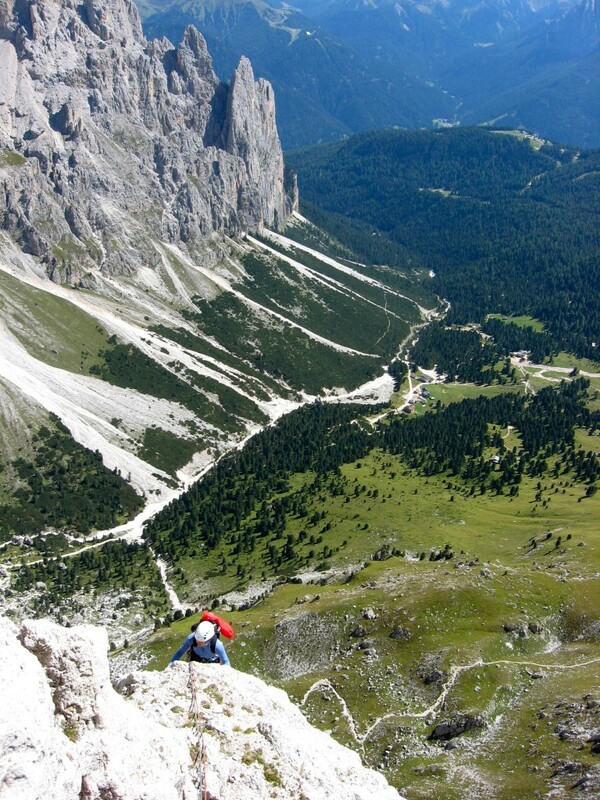 Shirley hiking down from Cima Catinaccio after our climb of Steger. Vajolet Towers dominate the view. 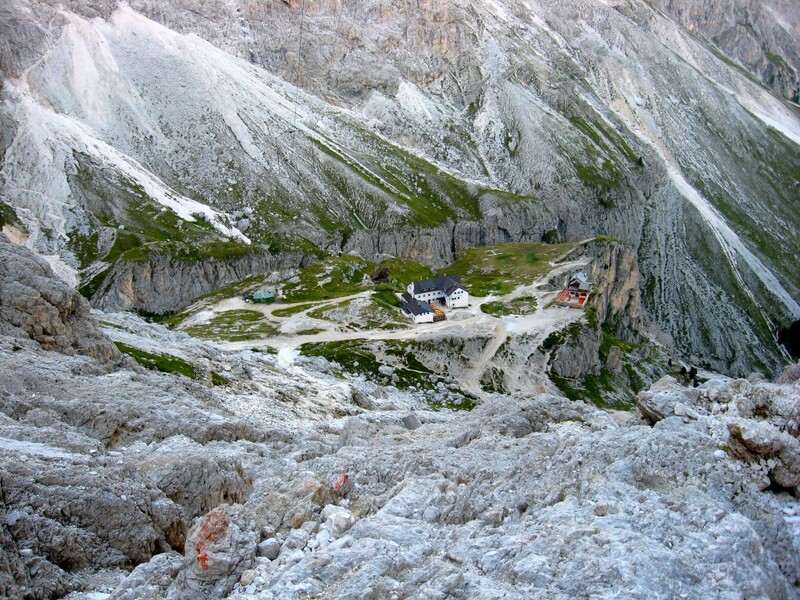 Rifugio Alberto is also visible (Sept. 2008). 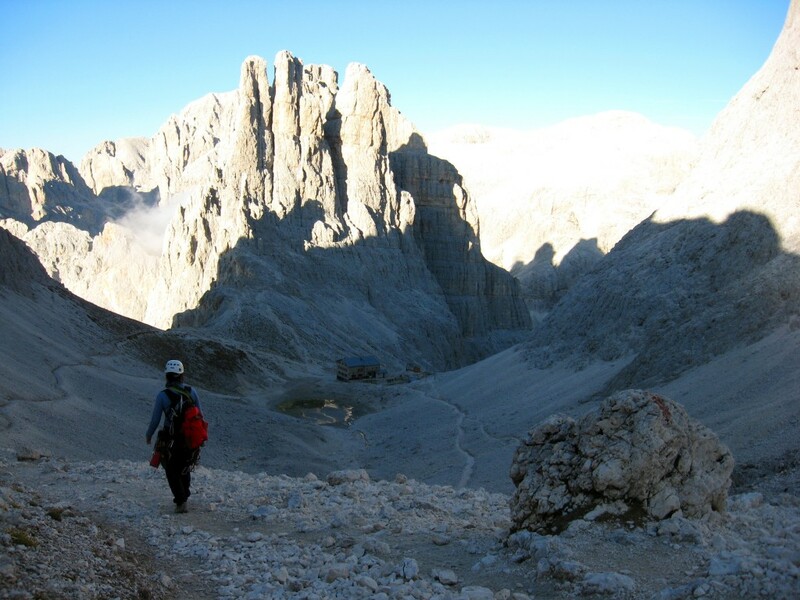 Rifugio Vajolet and dinner as seen during the hike down from Cima Catinaccio (Sept. 2008). 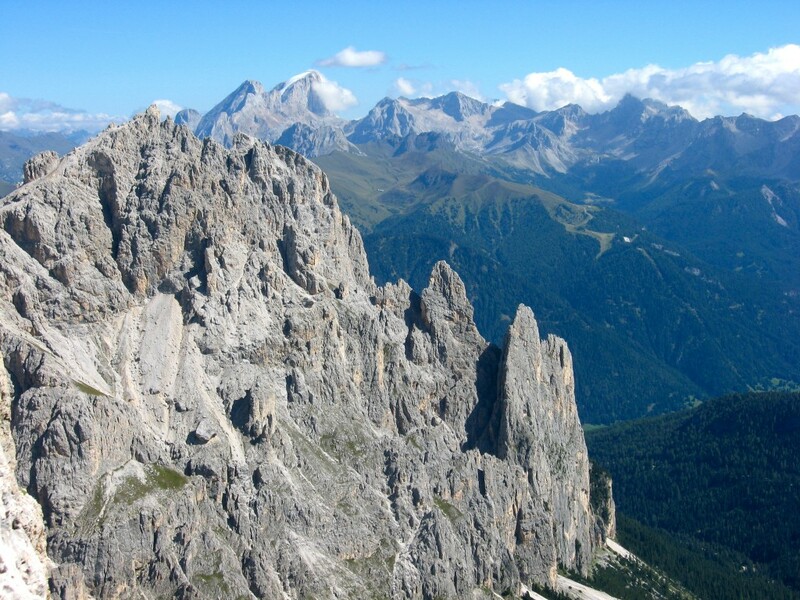 Punta Emma formation is on the left and Vajolet Towers are showing through the notch (Sept. 2008).